Iran's Supreme Leader Ayatollah Ali Khamenei has emphasized that negotiations between his regime and western powers are limited purely to Iran's nuclear program, and not other issues such as its support for global terrorism. "We allowed negotiation with the US only on the nuclear issue for certain reasons," Khamenei said in a speech. "In other areas we did not and will not allow negotiations with the US." Khamenei expanded on his comments on his official Twitter account, declaring that "US officials seek negotiation with Iran... [as a] means of infiltration and imposition of their wills." "We allowed negotiation with US only on nuclear issue for certain reasons, in other areas we did not and will not allow negotiations with US," he added. 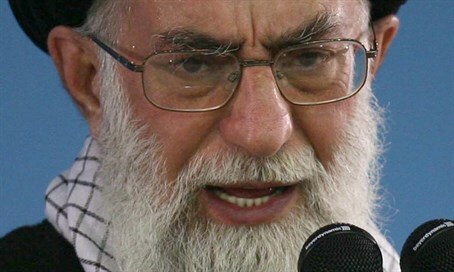 Khamenei followed those statements with aggressive remarks towards the "Great Satan" America, and Israel - saying the Jewish state would not exist in 25 years' time. "@IRKhomeini stated “US is the Great Satan,” some insist on depicting this Great Satan as an angel," he tweeted referring to the founder of the Islamic Republic of Iran and his predecessor, Ayatollah Ruhollah Khomeini. Iran, he insisted, expelled the "Great Satan," by "barr[ing] their direct access and now we must not allow their indirect access and infiltration" via continued negotiations or any warming of ties in general. Ironically, Twitter is banned in Iran, with messages like these meant for external audiences only. Khamenei's declaration comes less than 24 hours after US President Barack Obama scored his latest, and most decisive, victory in his campaign to override opposition to the deal in Congress, obtaining the necessary 41 Senators to filibuster a vote on the issue. That latest White House achievement came just one week after Obama won enough backing from Democratic members of Congress to carry through a presidential veto, should he opt to use it if a Republican-majority Congress votes down the deal. With 42 Senators now backing the president's position, a filibuster would avoid even the need for that.